I believe we all can agree that when it comes to teams and teamwork, communication is everything. For the team leader, however, different situations require different kinds of communication. In every- day work life, the key leadership communication skill is facilitation. You use facilitation, internally, to delegate, to lead meetings, and to mediate conflict as it arises. Nevertheless, not all of the team leader’s responsibilities are internal. From time to time, the leader must step out, externally, and represent the team to management and to other stakeholders. Whether it’s a pitch, a request for funds, or a quarterly report, the team leader must occasionally make a formal presentation on the behalf of her team. And for many of us, this is terrifying! Public speaking is different from facilitation, with very different communication requirements. Where facilitation is improv, public speaking is a staged, scripted production. Public speaking is a performance piece! What follows are 7 tips for boosting your speaking skills and hence, boosting your team’s cause to the company at large. 1) Make Eye Contact (but not just any eye contact): When standing behind the lectern, the temptation is to sweep the audience with your eyes: Left side of the room, middle, right – repeat. Although better than looking up to the ceiling or down at your shoelaces, “eye sweeping” is still distracting. A much more effective technique is to find a friendly face and make eye contact with that one person for 3-5 seconds. Then, calmly, find another person to hold in your glance for 3-5 seconds. And so on. Although the “machine gun” approach to eye contact is compelling — peppering your audience with attention — people will respond much more positively if you slow things down and share your eye contact with one person at a time. By making a connection with individuals, the whole audience somehow feels attended to. 2) Employ Gestures Strategically: When it comes to gestures, there are two types of speakers – the “grand gesticulators”, and the “minimalists”. The first type is all over the place, motioning up and down, left and right; the bigger the hand gestures, the better. The second type is more subtle. They keep their arms at their sides, or resting on the lectern, or clasped securely in front of their chest. For the minimalist, the important thing is the content, not the theatrics. My own feeling is that the middle path is the most effective. By all means use gestures, but not in a way that’s distracting. Be strategic! As a rule of thumb, rest your arms at your sides, make your gesture, then return your arms to your sides. Although it may feel more safe and comfortable to clasp your hands, or to put them in your pockets, neither of these techniques is particularly effective. For maximum impact, let your arms drop to your sides and initiate your gestures from there. 3) Grab your Audience’s Attention: As a rule, you have no more than 7 seconds to get peoples’ attention. After that, well – you haven’t lost them exactly, but you’ve missed a big opportunity. Crafting a strong opening is absolutely vital to your effectiveness as a public speaker. So how do you do this? Lots of ways! One of the best approaches is to lead with a story. “It was cold Monday afternoon in the fall of 2001 when I went to my wife, heart in hand, and told her, “I am going to be a doctor”. Everyone loves a story! Other strong openers might include a quotation, a stat, or a rhetorical question. Don’t miss that chance to grab everyone’s attention, thereby letting them know they’re in for a good ride. 4) Deliver a Strong Closing: Studies show that people only really remember the first thing they hear, and then the last. This is the law of “primacy and recency”. As this relates to speaking, you need to hit your speech with a strong opener and then nail your closing statement! There are many ways to do this. You can’t go wrong with a summary, of course. You an also use a quote or a statistic, much as you might do in your opener. It’s definitely a good idea to leave your audience with a call to action, ie. “As you return to your office, I invite you to consider how you can be more kind to the people in your life.” To up your game even further, including a “call back”. This means that you refer back to your introduction in your conclusion. For example, if you quoted Abraham Lincoln at the beginning of your speech, you’d want to make sure you brought your talk full circle by mention him again at the end, perhaps with a follow-up quotation. Call backs bookend your talk and give it a satisfying symmetry. 5) Employ Vocal Variation: What happens when a speaker drones on and on, in a monotone? Two things: either people whip out their phones and start checking their Twitter accounts, or they fall asleep in their seats. The lesson, then, is don’t drone! Vocal variation means that you mix things up. Sometimes you speak faster, other times slower. You take pauses after important points (and jokes). Occasionally you speak loudly, shocking people out of their seats. Other times, you lean in and whisper, and everyone leans in to hear your pearls of wisdom. The more you vary your speaking style, the less z’s you’ll hear from the audience (or Angry Bird squawks). 6) Use the Stage: Much like the #3 above, movement is like gestures – it’s great, in moderation! There are hyper-frenetic speakers (think Robin Williams) and there are stationary orators (say your average college professor). The world’s most effective speakers us the stage intentionally – moving to the left, stopping and making a few points, then doing the same for the middle and the right of the stage. They do NOT pace, like angry bears. Use the stage strategically—keeping things interesting for your audience without making your movement distracting. 7) Ditch the Notes: Consider how you feel when a speaker constantly looks down and consults their notes. 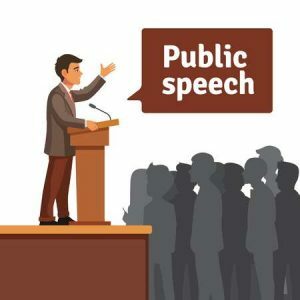 Now contrast that with the impact of a speaker who has memorized their speech and is connecting directly with the audience throughout the full course of the talk. Ditching your notes makes a huge difference. Not only are you making more eye contact, you also look more professional and competent. You come off as an authority who really knows his stuff. Ditching your notes requires a lot of practice, but it doesn’t have to be painful. There are plenty of memory techniques available for getting your speech into long-term memory, many of which go beyond mere rote memorization. I favor a very old and honored technique called the Memory Palace (click here for a demo). Whatever technique you wind up using, you will definitely reap the benefits of ditching the notes! This is just the beginning, of course. There are myriad books on the subject of public speaking. There are coaches just waiting for your call. And there’s a marvelous organization called Toastmasters where you can practice public speaking monthly at a reasonable fee. The important thing is to practice, practice, practice. Your team will thank you for it! 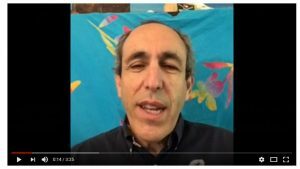 For two more great public speaking tips, click on the video below with the author, Dave Blum, founder and president of Dr. Clue, teambuilding scavenger hunts and more.